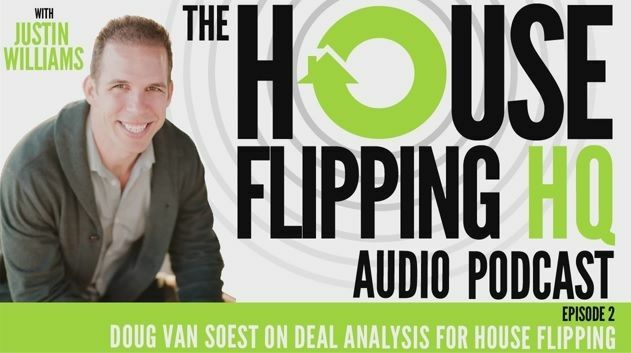 In this interview, Justin Williams of houseflippinghq.com talks with Professional Real Estate Investor Doug Van Soest about how he got started in Real Estate Investing as well as how to analyze deals to ensure a win-win scenario for clients. Who is Doug Van Soest? Justin: All right, House Flipping Nation. Let’s get this show on the road. I’m super-pumped to introduce to you our first guest ever on the House Flipping HQ Podcast. He’s a good friend, colleague, role model, mentor. We’ve done tons of business together. We’ve owned rentals together. We’ve done flips together. We’ve worked out together. We’ve been through it all together. I’d like to introduce to you the one, the only, Doug Van Soest. Doug: What’s up? What’s up? Justin: How’s it going, Doug? You ready to get this house flipping party started or what? Doug: I’m as ready as I’ll ever be, man. First guest. I’m excited. Justin: Let’s do this. So Doug and his amazing wife, Andrea, have been investing full time in real estate for just over five years now. They have purchased over 150 houses and currently own 40 rentals and counting. Man, I don’t know how you manage all those tenants. They have three beautiful young children, and they’ve built their business around the mindset of family first, which, knowing Doug, I can definitely attest to that. All right, Doug. I’ve given House Flipping HQ Nation a brief overview of what you’ve accomplished in such a short period of time. Why don’t you elaborate for us a little bit? I know you didn’t just start flipping tons of houses last month. Give us a little more of an idea of your journey, where you came from, and what you’re currently up to. Go for it. Doug: Okay. Well, thanks. First of all, thanks, man, for inviting me on. I’m super excited. I really love the website. You’ve created tons of great info. What a great resource, man. I wish I would have had access to that site when I was first getting started. You can kind of go to a one-stop shop and get all of the info you need right there. Justin: Too kind. Thank you. That’s the goal. Doug: No, and of course, we have a lot of history together, so I know that you’re going to put some good stuff out there. Justin: That’s what we’re trying to do. Doug: But yeah, a little bit about my wife, Andrea, and I. We’re kind of a partnership. We were married about 13 years ago, and while we were engaged, one of my buddies gave us the book, ‘Rich Dad, Poor Dad’. Doug: Just like half the people in this business have read that book at some point. Doug: We read that book, and it just completely changed our mindset on business and investing and real estate, all of that. So literally three months into our marriage, we quit our jobs. We moved to Colorado Springs, Colorado, where my brother was living, and we started a concessions kettle corn business. Doug: Just wanted to do something entrepreneurial. Doug: Kind of get our feet wet with that. We did that. We loved it, had a great time. We were in Colorado for two years selling kettle corn at all the major sporting events and Bronco games and things. Doug: You know it. Got a good year going here. Then we sold that. Ultimately, we knew we wanted to get into real estate in some fashion, and we wanted to kind of come back to California, where a lot of Andrea’s family was. So we sold our business, moved back here, and got into real estate. I got my appraiser license, just started getting familiar with the industry, and Andrea got her real estate salesperson’s license. A couple of years into that, we were still wanting to get into real estate. We didn’t really know a whole lot about this real estate investing world other than what we read in ‘Rich Dad, Poor Dad’, but I actually started listening to podcasts, believe it or not. Doug: Yeah. I found a podcast on real estate investing and started listening, and found a few more and started listening to those. What a wealth of information. I still to this day have half a dozen or more podcasts on real estate investing that I listen to when I’m driving around or working out or doing whatever. They ultimately pointed us to go to some real estate investing clubs in your local area. Doug: 20% a year or 30% a year or something more even. It was nerve wracking, but fall of 2008 we bought our first house, and we never really looked back. We’ve been full blast ahead ever since then, a little over five years. Justin: So you made it work in the toughest of times, basically. Doug: Yeah. People were really, our family and friends we knew were kind of thinking, you’re doing what? You’re in real estate right now? But we didn’t look at it that way at all, actually. You know, just two years before that, prices were priced out of the market, really. Doug: We saw it as an opportunity. I mean, the prices were cut in half or even a third in some areas where we live. We saw it as a chance to really get in, I guess, at that point. Justin: Awesome. I think I started maybe a year before you did, so I kind of went through the same thing, and I hear you completely. I think that just goes to show that you can, if you adjust your strategy, you can do this business at any time. So that’s a good point. Okay, so there’s a reason why I wanted to start with Doug as our very first-ever guest. As he mentioned, he’s been an appraiser for over five years, five or six years. Doug: Yeah. About eight years, actually. Justin: Oh, about eight years? Okay. So he’s been an appraiser for eight years, full time investor for over five. Doug: 10 years. I’m sorry. I’ve been an appraiser since 2003, yeah. I’m sorry. Doug: Where has the time gone? Justin: So Doug can see this business – and his wife, Andrea, is a real estate agent, so of course they have MLS access. Doug is able to see this business from many different aspects, especially when it comes to deal analyzation. Like I mentioned, that is the single most important thing you can know about when getting into this business. If you don’t know it, you’re dead in the water. They’re not going to teach it to you on the house flipping shows. It may not be super exciting, but that is what we’re going to talk about today. Doug is going to teach us how to analyze a deal from the perspective of an investor so that you know that you’re making offers that – I don’t want to say guarantee, nothing is guaranteed, Doug and I both know you absolutely can lose money in this business – but so you can ensure – give yourself a very good chance of making a profit and make sure you know all the expenses that are involved. So we’re going to kind of go through that and take you through these steps. This is one of those episodes that you are going to want to listen to time and time again to make sure that you understand this process, because this will make or break you in this business. Once again, it’s not going to be all glamorous and exciting, but it is the foundation of your real estate investing business and your house flipping business, and you will not be able to do anything without it. So without further ado, Doug, are you ready to share with us your mind-blowing information and how we can make lots of money in this business? Doug: Yeah. No pressure, right? Justin: No pressure at all. It is up to you. All right. Let’s dive in then. Okay, Doug. So I’m totally new to the investment business. I really want to get into house flipping. I actually magically managed to find two deals, but I have to send an offer in in one hour. I have no idea what to offer. Help me, Doug, please. I have one hour. Help me make these offers. Where do I start? Doug: Sounds like 2008. You have one hour to get your offer in and get it in fast. Well, I think the first mistake that a lot of new people will make, Justin, being that you’re new, the first mistake that you absolutely do not want to make is don’t take anyone’s opinion of value as the value, especially if there’s a real estate agent who’s trying to sell you this deal and they say, hey, Justin, I’ve got this deal and it’s worth $400,000. You can have it today for $250,000. Don’t just take $400,000 as, oh, this guy’s an expert. He knows, so it must be $400,000. Big mistake. You have to have a way to form your own conclusion and know that that property is going to sell for $400,000. At least you believe that it’s going to sell for $400,000, not because somebody else told you that. Doug: So the first thing that you want to do is if you’re thinking it’s a deal, you have to have a good idea of what it’s going to sell for, if you’re going to flip this house. Doug: The idea is to make a profit, not to get a very expensive education. Justin: Okay. So go to Zillow and get the Zestimate, right? The Zestimate? Doug: Yeah, absolutely. It’s one click. It’s real easy. You just go to Zillow. Type in that address. You’re good to go. Justin: All right. Ready, thanks. We’ll talk to you later. Doug: You would not believe how many people do just that right there and that’s it. Justin: Oh, man. I know. Doug: Yeah. That can be very dangerous. We’ll get to Zillow later. But the first thing you want to do is, I mean, if you don’t have access to the multiple listing, first of all, you’ve got to get access to the multiple listing somehow. Justin: That multiple listing, that’s called MLS, right? I think I’ve heard it called Multiple Listing Service? Doug: Yeah, the MLS. Right, the Multiple Listing Service. That’s the online database that all the agents will list their properties. Probably 95%, at least in Southern California, 95% of all residential homes are going to be for sale listed on the multiple listing system. And not only that, it gives you all the access that the agents and appraisers use to analyze those homes. You can go to realtor.com or Zillow, and you’ll get limited information about listings in your area if you type in your area, your address, but you don’t get all the data that the Multiple Listing Service will give you. There will be days on market. There will be comments just for the agents about that house. Oh, this house has a cracked slab. That may not be in the actual description that you’d read on Zillow. A lot of information like that. Plus, you can do really customized searches and find specific sales that are narrowed down to your criteria that you’re looking for that you probably can’t do on Zillow or realtor.com. Doug: So try to get access to that if you can. Justin: So how would I go about getting access to the MLS? Doug: Well, you marry a real estate agent. It’s really easy. Justin: Nice. Or you, in my case, I married my wife and then had her become a real estate agent. There you go. Doug: There you go. Well, one thing you can certainly consider, if you’re in this business for the long haul, which, if you’re going to start flipping houses, I think you probably are, get your own real estate license. I think it’s a great idea. Doug: In my opinion, it’s not, you know, you’ll have different opinions on that. I don’t think it’s a liability at all. I think it’s good to get. Justin: It seems like back in the day a lot of people were saying it was a liability, but that mindset seems to have really changed over the years. At the end of the day, if you’re doing the right thing and just disclosing that you’re an agent, I don’t see a problem. Doug: Yeah, I agree. I don’t either. It’s just about disclosure. You’re not trying to pull the wool over anybody’s eyes. You can get access to that data. It’s like $400 a year or something. It’s really not that expensive, and it’s well worth it. Justin: It’s really easy to become a real estate agent. Doug: Yeah, you take some tests, take a couple of classes, and you’re there. If you don’t want to do that, there’s other ways. Become friends with a realtor and try to work out some deal where maybe you’re going to give them a listing when you go to sell that house, since you’re not licensed anyway. Somebody needs to list it. Become a realtor’s assistant. I’ve heard of people doing that. I’ve never done those things. There’s probably certain rules within the different board of realtors, but there’s lots of ways to get access to it, and that’s definitely a must if you’re going to really be accurate on trying to determine your value that the house will sell for. Doug: Now, I call this the ARV, After Repaired Value, so if you hear me say ARV, that’s what I’m talking about. Justin: After Repaired Value. You said that’s what the home will sell for after we fix it up, right? Doug: After we’ve fixed it up and do the things that we’re going to do to it, that should be what the house would sell for. Doug: So when you’re looking at a deal, you’ve got an hour. You’ve got two houses that you’re trying to determine what to make an offer on, right? Doug: Okay. First of all, you’re going to look at those houses and you’re going to try to determine if and what work needs to be done to those houses to make them sell for top dollar. Justin: Before we get too much into repairs, let’s jump back a little bit to the ARV. Justin: So I’ve got to find this ARV. I have access to the MLS or I know someone who does. How do I know what my house is going to sell for? I kind of get it. You said what my house will – I don’t know, I’m kind of confused still. Doug: Okay. So determining ARV – and this could be a whole week lesson in itself – but essentially what you want to do is run comps, or comparables. Now, if you don’t know what that is, you try to get access to the MLS or some kind of system that’s going to give you the sales data for your area, what has sold and what’s for sale right now on the market. It’s a big mistake to just listen to your agent on what he says it’s worth. It’s also a big mistake just to go look at a house and think, oh, well I would pay $500,000 for this house and they’re willing to sell it to me for $400,000, so that must be what it’s worth. You really have to learn to separate your own emotions versus what the data is going to tell you. Justin: So it’s about the data? Doug: It’s about the data. And here’s why I say that. Because coming from – I’m an appraiser, so coming from that perspective, I need to know – if I’m going to sell this house, I need to know what the buyer’s lender is going to lend on the house based on what their appraiser tells them it’s worth, not what the buyer thinks it’s worth, not what the buyer’s agent thinks it’s worth. It’s all about what the buyer’s appraiser thinks it’s worth. Justin: Okay. So tell me more about this data. What kind of data am I looking for? Doug: You’re looking for recent comparable sales. So what’s a comparable house? Something with similar size, similar age, similar location, if you can get it within a mile for sure of your house, depending on where your house is located, preferably a half mile or less. You’re also looking for recent sales. So if it sold last week and it’s right down the street and it’s the same size as your house, that’s an excellent comparable sale. Doug: The further away you go, the further back in time you go, the less reliable, I guess you’d say, that comparable sale would be to your house. Justin: Okay. So my agent sent me this list of houses. It has five houses that are listed for sale; it has a couple that she said are pending, which she told me that means they’re under contract, but they haven’t sold yet, but they might sell for this amount; and then she sent me six more that have sold. Now, these are all similar in location and size, but I notice some of them need a lot of work and aren’t rehabbed or fixed up at all, and the other ones are in really good condition. What she did is she took all these numbers and she combined them and she came up with the average and she said, that’s what your house is worth. Is that right? Is that how I go about it? Justin: Okay. True story. This is what agents will do, right, Doug? Doug: Oh, yeah, absolutely. This is exactly how people would come to a conclusion of value, and you can understand why. I mean, they’re just going to take the sales, they’re going to average it, maybe a cost per square foot, something like that, and say, this is what it’s worth. Justin: What’s interesting to me is that is not the wholesale or the retail value. It’s not either. Doug: It’s an average, or a median. It’s really nothing about your house. Justin: I guess if your house is average, then it might be about right, but it’s not going to help you come up with your offer in any way. Doug: Right. So you’re looking at those sales. The most important thing out of all that data your realtor just provided you is going to be the houses that actually sold. Okay? Doug: There may be five houses for sale that are in a different price range than what has actually sold. The appraiser is going to look at what has actually sold the most when they’re trying to compare or determine a value for your house. So that’s the data you want to give the most weight to. Doug: Now, within those sold houses, like you mentioned, you’re going to have houses that need a lot of work, and you’re going to have houses that are beautiful, remodeled to the condition that we’re looking to do with our house that we’re going to make an offer on. So obviously, you want to take into consideration, and you want to probably give more of a weight or more consideration to the houses that are repaired in the condition that your house is going to be because that’s going to be more similar. Doug: You may have the same house, for example – and this was very common especially in 2008, 2009 when foreclosures were through the roof – you’d have two very different comparable sales. You’d have the bank-owned foreclosed houses that were dilapidated, needed a lot of repairs, then you’d have the repaired houses, the fixed houses, the houses that investors had bought, fixed up, put back on the market, or just nicer homes. So you’d have two very different sales. So you’ve got to learn how to separate those. Justin: Okay, got it. So I’m going to toss out all these ones basically that need a lot of work. I’m going to focus on the ones that are fixed up, and that’s how I’m going to come up with what I think you called the ARV, or After Repaired Value, which is what my home will sell for when I go to actually list it for sale after I’ve fixed it up. Justin: That makes sense. Okay. I got you. Then you mentioned from there you figure out repairs, I think? Doug: Yeah, and that’s probably a whole podcast in itself, but you’ve got to get somewhat familiar with the basic repairs you’re going to be doing on a house. What’s it going to cost to paint, what’s it going to cost to remodel my kitchen, to landscape the house? You don’t have to be an expert at repairs. I certainly wasn’t an expert when I started, and I’m still not an expert, but I have a pretty good idea now after all the houses we’ve done. I can get pretty close on a guess. But just starting out, I didn’t know what I know now, and you still have to make an educated guess and get some opinions that you trust. Justin: Okay. Are there any rules of thumb that I can use to – I’ll take my contractor to double-check the numbers, but just give me an idea so I can have an idea if I’m in the ballpark. Doug: Yeah, and actually, we made a really bad video about this, and it’s on your blog, I think. Justin: Yeah, and I’ll link up to that in the show notes. I’ve gone through this more in detail on the blog. There will be several spots in the show notes where I link up to some of those posts that you can reference to. But let’s try to cover a little bit on how they can kind of start the estimating repairs process or a few formulas they can use to help them out. Doug: Okay. Well, it certainly will vary depending on your area and what types of homes and neighborhoods you’re in, but for most of the areas that I work in, which is just the move-in, first-time homebuyer type properties and maybe the move-up properties, we do a quick estimation based on the square footage of the house. Let’s say we have a 1,000 square foot house and we kind of have, I don’t know, three tiers that we would estimate. Maybe $15 a square foot if it doesn’t need a whole lot; maybe for a middle repair job, maybe $20 a square foot; and if you’re going to redo everything, maybe $25 a square foot, and maybe even add some on top of that if there’s big items like a pool or it needs a complete roof replacement, things like that. You can just estimate. So say $25 a square foot on a 1,000 square foot house, that’s going to be a $25,000 rehab. Again, don’t go by that completely, but that is a good way to just kind of ballpark a repair estimate if you have to do it quickly and try to get close. Justin: Okay. So this is kind of the rule I go by, which I think you, I don’t know if you taught it to me or if we discussed it together or what, but basically if it’s a house that basically needs everything redone, flooring, new bathrooms, new kitchens, paint, carpet, hardwood floor, I ought to mention that, base boards, maybe a little bit of landscaping in the back, maybe some new doors, basically needs a complete what I would call a cosmetic remodel, no major plumbing issues, no major electrical, no structural or roof or pool or HVAC, then that’s where I would say, okay, you’re about $20 per square foot, right? Doug: Yeah, that’s kind of the middle. Justin: So a 1,000 square foot home, you’re looking at about $20 grand for something like that. A 1,500 square foot home, about $30 grand. And then on top of that, you can add another $5,000 to $8,000 for a roof, another $5,000 if you need to redo some pool work. And that’s sort of going to give you an idea. We don’t want anyone to go out and say, hey, these guys told me this is what it was going to cost to fix our house. This is our disclaimer. But that will kind of give you an idea of going into it what the repairs would be. And then of course you can subtract as well if there’s a lot less work, which would bring you to, like what you mentioned, the $15 per square foot amount. We’ll link up to that again in the show notes on some of the posts that go into that in more detail. As always, you can ask questions in the comments below, and I’m sure Doug will hop on and help us get some of those answered. Right, Doug? Justin: That’s how you commit somebody online, live. Commit them in front of thousands of people. All right, Doug. So we’ve come up with our ARV, our After Repair Value. We’ve figured out the repairs, or at least we have a pretty good idea. Going back on repairs real quick, I’m really scared, because if I’m off by $1,000, then I’m going to lose $1,000, right, when I go to sell the house? I just lost $1,000 because my repair estimate was off by $1,000, so I’m toast, right? Doug: Listen, in my opinion, if your deal is that tight, that’s not a deal. You probably shouldn’t be buying it if you’re trying to pinpoint the repairs down to within $1,000 making or breaking, losing money or making money, on this house. Doug: Now, we have a – I don’t know if you want me to go into the basic universal formula for buying a house? Justin: Let’s do it, man. Doug: Let’s do it. So there’s a formula that most people use, and I think it’s a good one to stick to until you can fine-tune your numbers and get really good at this; you might be able to get more aggressive. But the general rule of thumb that’s going to keep you pretty safe on buying a house is what’s called the 70% rule. You want to take that After Repaired Value number that we’ve just determined, whatever that is. Let’s say it’s $200,000. Multiply that by 70%, so times .7. I don’t have my calculator here, but whatever that number gives you. Doug: $140,000. Then you’re going to subtract the repairs that you estimated. So on that house, say that was a 1,000 square foot house that we estimated $20 per square foot. That’s $20,000. So we’ve got the $140,000 minus the $20,000. That’s going to make your offer price, or your buy price rather, that you can buy the house at $120,000. Justin: Okay, so the house is worth $200,000 after I fix it up, not worth currently, the ARV, like you said. And I’m going to offer $120,000 based on the formula. Doug: What that formula does, that accounts for commissions to your real estate agents, possible credit to your buyer, it figures a hold time of four to six months with carrying costs in that, some contingency in there. If you work it all out, it should give you a 10% to 12% profit or more on the After Repaired Value. Doug: That’s for a beginner. You don’t want to assume that you’re not going to have expenses that you may have. You want to be safe and conservative, yet you still want to buy a house and make some money. Doug: So the 70% rule will account for a lot of expenses, and if your price drops 5% in that time period for some reason, you’re still going to be okay. Justin: You’re still going to be okay. I’m not going to lose $10,000 because my price dropped a little bit? Justin: Okay. So you mentioned commissions and closing costs. It sounds like you gave me a formula that helps me figure those out. That’s awesome. I could basically skip even knowing that, but just so I have a better idea, what are some of those expenses, and about what are they more or less that I haven’t heard discussed on these house flipping shows? I’ve never heard them talk about that. It seems like they include the repairs in the purchase price, and the rest is profit. But you’re telling me that’s not true. Doug: Not true, not true. Yeah, there are a lot of costs involved in buying a house and selling a house that aren’t necessarily in the little numbers on the bottom of the screen on the house flipping shows. Typically, when you’re selling a house, you’re going to need the assistance of a real estate agent possibly to want to list the house on the market and another one who’s going to be the agent representing the buyer for that potential house. Well, the going rate is anywhere from 2.5% to 3% of the purchase price per side. So you want to figure on 6% commissions off the top, and that just goes to the real estate agents for selling the house. Well, but I want to sell it by owner, or well, I want to do this. Okay, that’s fine, but most people are going to list the property on the market to get it exposed to as many buyers as possible. You want to figure that in when you’re selling a house, especially if you’re new. Doug: So you want to figure on about 6% for commissions, and then maybe another 2% to 3% for a credit to the buyer. Sometimes they ask for a credit for closing costs or for this or that repair or termites or what have you. Termites is another thing that’s going to come in to bite you. You have to have a termite inspection, and if you didn’t do that when you bought the house, you may have some termite repairs to do. Then you have holding costs. People always forget holding costs. Unless you bought this property with cash out of your pocket that you had, you want to – you’re probably going to be borrowing money to buy the house. Most of us do. I do. So there’s a cost to that money to borrow it, and then each month it’s accruing interest, so you have to figure in whatever that cost is. And then, I don’t know, let’s have a 2% to 3% contingency. You still don’t know what else is going to come up, what other repairs you’re going to have to do as you get into escrow. Perhaps you need to lower your price for some reason a little bit to compete with another house that came on the market. You just don’t know, so you want to have enough of a cushion to be able to adjust if you need to and still make a profit. Justin: Okay, awesome. Once again, I go over this in more detail on my blog about analyzing properties, which we’ll hook up to in the show notes. Okay, incredibly valuable content. You’re telling me that that 70% rule should pretty much cover those costs, right? Doug: Yes. I’m saying if you’re new, that’s a good rule of thumb to use that takes into consideration all of those costs. Justin: Okay. Now, does that rule work if, let’s say that I have a major fixer-upper. Maybe I’m even building a house. It’s going to take me about a year and a half, a year to a year and a half to finish. Should I still use the 70% rule? Doug: No. Like I said, I think it accounts for a four to six month time frame. That’s what your target would be there. You’re talking a year and a half. Just add in the extra costs for all of that. Justin: Okay, awesome. I think you and I, over time, you mentioned if you’re starting out, because you want to make sure you have all your bases covered, you know, if you want to buy a higher volume and you get really good experience, you may push that number a little bit to 75% or something, assuming it’s an easy rehab. But those are all things you learn over time, right? Justin: When you’re first starting out, the key is actually getting out there and making offers. You’re going to learn so much just from doing that. Even if you don’t get a ton of offers accepted, you’re going to have a much better feel for what you’re doing. Doug: Absolutely. Yeah, you’re going to be basically estimating repairs on all these houses while you’re making the offers. You’re just going to get better at that. You’re going to be comping out or running comparables on all the different houses that you’re making offers on. Definitely get out there, make a bunch of offers, because you’ll learn just from that. Doug: In fact, we made, we didn’t go into this, but we made offers – we actually had an agent writing the offers for us, but we were the ones finding the homes on the MLS and doing the research for probably six to eight months before we actually bought our first house. Doug: We wrote 100 offers or more before we actually got a house. It depends on the market and what you’re doing, but at the time, that’s what we did. Justin: Okay. So you made 100 offers before you bought your first house? I’m not saying that as the investor, I’m saying that as the new person looking to invest. I’m shocked, right? So it’s important. It’s a numbers game, right? Doug: …because we knew that in six months, our house was going to be worth 10% less than it is today. Justin: Good point. Okay. So there’s some things you should adjust for. Doug: Yeah. The 70% rule isn’t right for every situation, but it is a good rule of thumb. Justin: That’s such a good point I think, because someone might be listening to this a few years from now, and if for whatever reason the market’s going down – I’m not predicting the market here, I’m just saying that you want to adjust that down, or maybe the reason why I feel like we can push it a little bit right now is because the market is going up. Not that I would push it too much, but you want to adjust for what’s happening. Now, I’m not saying adjust very much. I don’t want to make this sound wrong. We don’t have a crystal ball and we can’t predict the future, but if you know the market is free falling, subtract that amount of money that you plan on making from your deal. Doug: Yeah. Again, be smart. Try and know the trend of which way the market’s going and to your best guess where you think it will be in six months. Nobody has a crystal ball, but that’s why I listen to people smarter than me when it comes to that. Whatever risk level you are comfortable with. Like you say, right now we can kind of push those numbers a little bit. We feel that our market has improved and is still improving. Doug: It changes every six months, it seems like. Justin: Yeah, no kidding. You’ve got to stay on top of this business. Justin: Well, wow, Doug. You’ve shared with us some valuable content and we’re all better off because of it. We thank you. We salute you. What is one last piece of advice that you would give to any new investor looking into getting to the house flipping business or someone who really wants to take it to the next level? What is one parting piece of advice you would give for them? Doug: Well, I just feel like coming back to this. It’s just take massive action and believe that this business can work, essentially. If you’re brand new, you’ve never bought a house, I’ve made offers for six to eight months. Didn’t buy a house, but we still knew and believed that we can make this work and that this business can happen. It takes action. Do something. Always continue to educate yourself along the way. Even now, I’m always listening to podcasts, going to seminars. You can’t get enough education and can’t learn enough about this business. You’re always learning. But the flip side of that is you don’t need to know everything to get started. You just need to know step one. Evaluate your deal and make some offers. You don’t worry about step two, three, four and five when you haven’t even completed step one yet. So don’t get too bogged down on all the things you don’t know, just focus on what you do, take some massive action, and suddenly, whether that’s getting an agent and making offers on the multiple listing, whether that’s sending out a bunch of letters to homeowners, whether that’s knocking on doors seeing if people want to sell their house, whatever it is, whatever your method is going to be, do it, do it consistently, do it over and over, and believe that it’s going to work. Justin: Love it, love it. Get educated, take massive action, surround yourself with amazing people like Doug Van Soest, and you’re going to be set. Doug: I appreciate all the kind words, man. Seriously though, you always mention that you’ve learned a lot from us and things like that, and vice-versa, we’ve learned tons of things, especially about the way you put systems together and your whole idea of making this a business. I’ve really tried to take that to heart recently in the kinds of things we’ve been implementing. So you’ve been instrumental with us as well, so I appreciate that. Justin: I appreciate it as well. I can’t thank you enough. Okay, before we leave, is there anything we can do for you, and how can anyone on the line connect with you? Doug: We have a website, and also I’m on Facebook. I’d love to connect with anyone out there who has any questions or anything. I’m always willing to help here in Southern California. Our website is freedomrealestatesolutions.com, we have a blog there and some before and after videos of stuff that we’ve done. Or you can go to facebook.com/dougvansoest. Justin: Awesome. Once again, we’ll link up to both of those in the show notes. Doug, I cannot thank you enough. Please keep selling us houses. We’ve bought lots of houses from Doug recently. It’s been lots of fun. Justin: Keep them coming, man. Keep them coming. Thank you so much, and we will talk to you soon, my friend. Doug: Thank you, Justin. Take care. Justin: All right, House Flipping Nation. I hope you enjoyed that interview just as much as I did. Doug is an amazing investor and an overall just great guy. Just to give you an idea, Doug is the only person I’ve ever allowed my parents to lend capital to to finance his house flipping deals. Well, other than myself, of course. But just an incredible guy, an amazing person. I’m really glad we were able to have him on today’s show. Now, if you have any questions at all, please head over to House Flipping HQ where you can find all kinds of other incredible resources. If you have any questions in regards to this specific episode, you can go to the podcast section and go ahead and find Doug Van Soest’s interview and leave any questions you have in the comments section, and either myself and/or Doug will be more than happy to answer those. And now, I have a favor to ask you. If you would be so kind, if you felt like you got any value out of this or anything that we’re doing here at House Flipping HQ, please head over to iTunes, leave us an honest rating and review, subscribe to the show. What this will do is it will help us be able to reach more people like yourself, be able to get the show out there even more, which will allow us to continue to grow and continue to have amazing guests on our show just like Doug. So head over to iTunes. Leave us an honest rating and review. I was going to say honest 5-star rating. Hopefully, it’s a 5-star rating and review. Subscribe to the show. Keep spreading the word. We will see you on the next show. Until then, happy house flipping.